How much do you know about the Goddess of Wisdom? Don’t miss the Temple of Athena Nike during your visit to the Greek Acropolis. 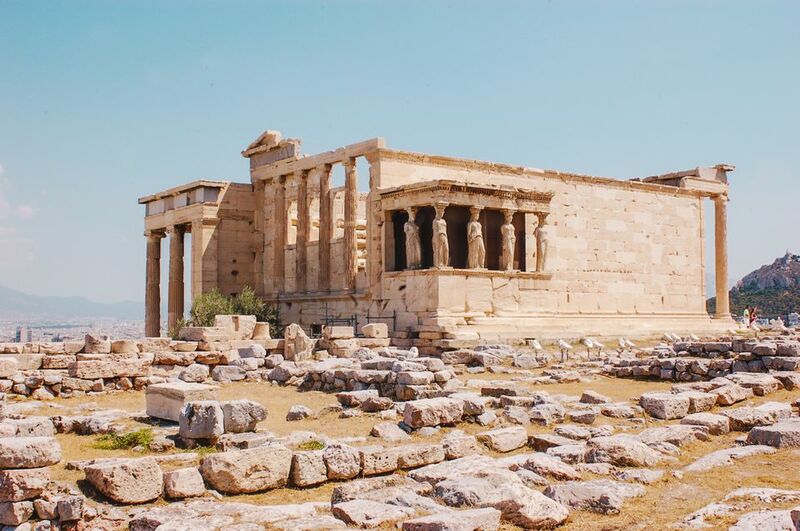 This temple, with its dramatic pillars, was built atop a sacred rock on a bastion around 420 BC and is considered the earliest fully Ionic temple on the Acropolis. It was designed by architect Kallikrates, built in honor of Athena. Even today, it’s surprisingly well preserved, albeit delicate and ancient. It was rebuilt multiple times over the years, most recently from 1936 to 1940. Here is a quick look at Athena, the Goddess of Wisdom, queen and namesake, as Athena Parthenos, of the Parthenon — and sometimes, of war. Athena's Appearance: A young woman wearing a helmet and holding a shield, often accompanied by a small owl. A huge statue of Athena depicted this way once stood in the Parthenon. Athena's symbol or attribute: The owl, signifying watchfulness and wisdom; the aegis (small shield) showing the snaky head of Medusa. Athena's strengths: Rational, intelligent, a powerful defender in war but also a potent peacemaker. Athena's weaknesses: Reason rules her; she is not usually emotional or compassionate but she does have her favorites, such as the beleaguered heroes Odysseus and Perseus. Birthplace of Athena: From the forehead of her father Zeus. It is possible this refers to the mountain of Juktas on the island of Crete, which appears to be a profile of Zeus lying on the ground, his forehead forming the highest part of the mountain. A temple on top of the mountain may have been the real birthplace. Athena's parents: Metis and Zeus. Athena's siblings: Any child of Zeus had numerous half-brothers and half-sisters. Athena is related to dozens, if not hundreds, of other children of Zeus, including Hercules, Dionysos, and many others. Athena's spouse: None. However, she was fond of the hero Odysseus and helped him whenever she could on his long journey home. Some major temple sites for Athena: The city of Athens, which is named after her. The Parthenon is her best-known and best-preserved temple. Basic story for Athena: Athena was born fully-armed from the forehead of her father Zeus. According to one story, this is because he swallowed her mother, Metis, while she was pregnant with Athena. Although Zeus's daughter, she could also oppose his plans and conspire against him, though she generally supported him. Athena and her uncle, the sea god Poseidon, competed for the affections of the Greeks, each providing one gift to the nation. Poseidon provided either a wonderful horse or a salt-water spring rising from the slopes of the Acropolis, but Athena provided the olive tree, giving shade, oil, and olives. The Greeks preferred her gift and named the city after her and built the Parthenon on the Acropolis, where Athena is believed to have produced the first olive tree. Interesting fact about Athena: One of her epithets (titles) is "gray-eyed." Her gift to the Greeks was the useful olive tree. The underside of the olive tree's leaf is gray, and when the wind lifts the leaves, it shows Athena's many "eyes." Athena is also a shape-shifter. In the Odyssey, she transforms herself into a bird and also takes on the form of Mentor, a friend of Odysseus, to give him special advice without revealing herself as a goddess. Alternate names for Athena: In Roman mythology, the goddess closest to Athena is called Minerva, who is also a personification of wisdom but without the warlike aspect of the goddess Athena. Athena's name is sometimes spelled Athina, Athene or even Atena. Planning a Trip to Greece? Flights to and from Greece: Find and compare Athens and other Greece flights. The airport code for Athens International Airport is ATH. Find and compare prices on hotels in Greece and the Greek Islands. Book your own day trips around Athens. Where Were the Percy Jackson Movies Filmed?